When I was at college and exams were coming up, the first thing I would do was to clear my room: find my desk, sort the shelves. All delaying tactics of course but important as, psychologically at least, I was preparing to get down to real work. I have obviously passed this on to my daughter as last week in preparation for heading back to school she decided to clear her room. This involved a very large pile dumped outside her room but nevertheless I was impressed with her intent. You see, the one thing I really can’t do is work with a desk in chaos. This philosophy extends to the rest of the home also. I really believe that by improving your physical surroundings: your home, your home office, even your work environment, that you can help with your general well-being and by extension your health. You might say that once a desk and a chair is provided what else is really required? Well nothing I guess but there are definitely some things that can help make the dreaded back to school excursion a little easier. Don’t you remember showing your friends your new pencil sharpener or rubber or pencil case? When I first starting writing this post I thought I would be showing you my shortlist of boxes of beautiful pencils, fancy pencil sharpeners, erasers that are the business and folders and notebooks that would cheer anybody up. But then I realised that that would in fact be grossly unfair. You see to me the joy in the perfect pencil lies not just in choosing it but also touching it, smelling it and scribbling with it on the little pads of paper that nice pencil shops happen to have. So instead, what I have for you this week is my suggested shortlist of where to go to get these treats along with some locations to get some foodie treats to sustain you on your morning or afternoon, as that’s what you should allow time-wise. (With apologies to anyone not in Dublin. I will also list the websites for all locations where you can also purchase goods, but maybe you could plan a similar outing wherever you live?). 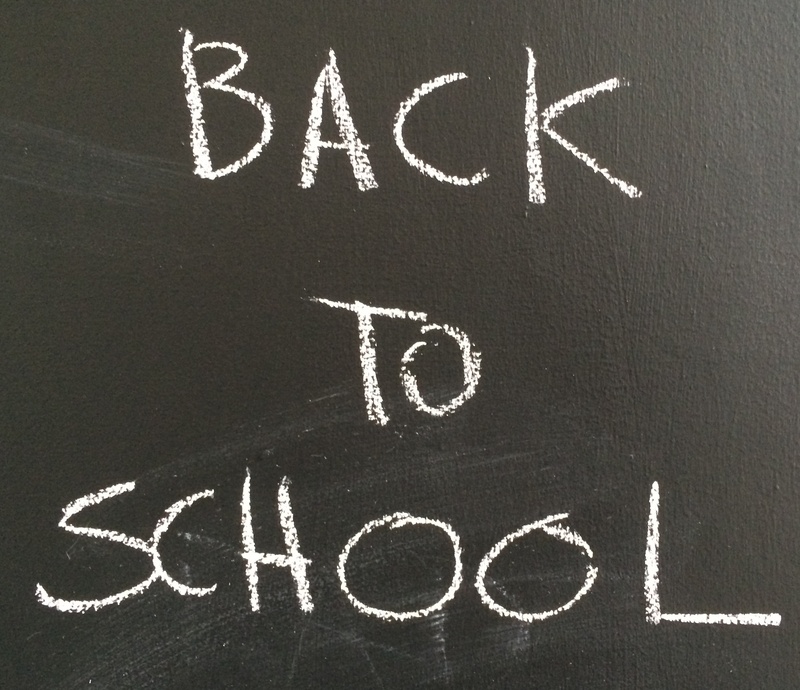 There will be enough long days in school so why not take some time out with your school goer head into the city, and have a fun time choosing the items that will (I assure you) make the Back to School trauma less traumatic. The map below shows the suggested route. The idea is that you start with a cup of tea and cake and finish with a great tasting lunch or vice versa. The people in the know about this secret café will not be happy that I include this. They would like to keep it just that, secret! It is hidden behind the Daintree shop and is truly an oasis. Located in a courtyard garden dripping with greenery, the interior is an eclectic mix: vintage but funky. The cakes and buns freshly made every morning are disastrously more-ish and the staff are super friendly. I promise if you go here you will return, time and time again. Whilst with back to school in mind you might not need too many fancy papers but you can still enjoy looking at and feeling the huge range of colours, textures and variety of the papers, envelopes and accessories available here. All your art and craft supplies are here with a discount for students. From oils, acrylics, watercolours to pastels, polychromos to pantones and a huge range of sketchbooks. You name it, it is here. Ok, so these three were all on one street. 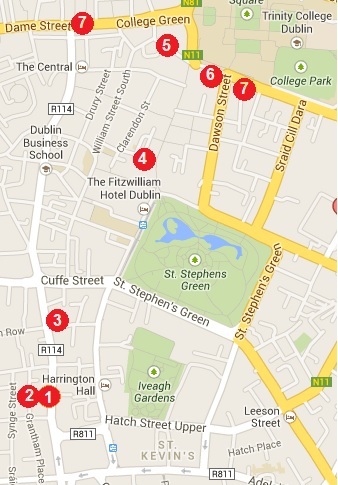 Now you have to walk for about 5 minutes to get to Grafton Street where the next few stores are located. Well known for its back to basics approach, the appeal of this Japanese store is definitely its simplicity. Boxes of beautiful pens and pencils, folders that will get you wanting to sort your paperwork, notebooks and diaries, containers for your pencils. You will find it hard to make decisions but if you only get one pencil you will have enjoyed the experience. I know I have mentioned these stores before but I simply could not do this piece without mentioning them again. Armed with just a few euro any child will have a field day here. Gillian Maxwell has brought this Danish design discount store to Ireland and for that, I for one, am very grateful. Good quality and low prices too. So now you have shopped till you have dropped. It’s time to treat your bones and admire your goods. Just a couple of doors up from Tiger is KC Peaches, one of a chain of whole food restaurants and stores brought to Dublin by savvy American Katie Cantwell and her Irish business partner Vincent Carroll who spotted a gap in the market here. This is seriously sophisticated yet simple food created using natural ingredients which are not just nutritious but tasty too. A new store just opened at 54 Dame Street also. This entry was posted in seasonal and tagged back to school, cake café, KC Peaches, O'Sullivan graphics, shopping, tiger store by Passionate about Design. Bookmark the permalink. i’m writhing with jealousy. how i’d love to bring my girls along and make this jaunt. 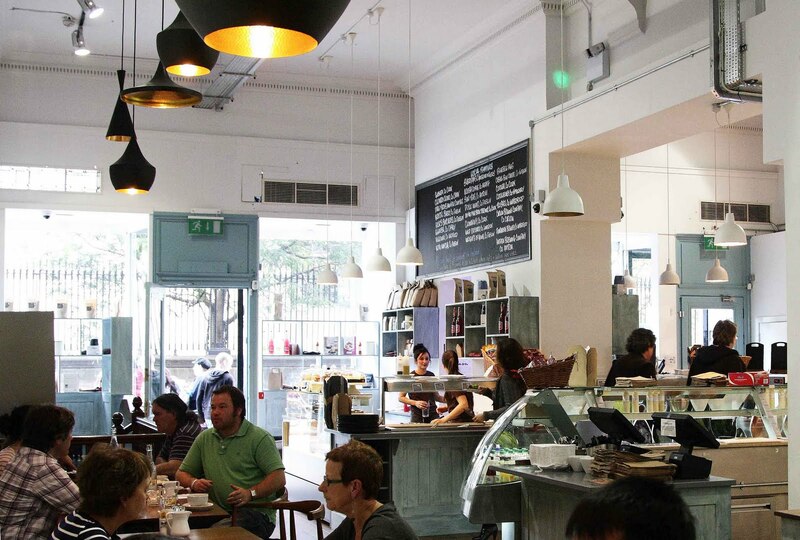 Maybe this post will inspire all the out of town readers to come visit Dublin? Would love to make this journey, but will probably have difficulty persuading my back to school sons (2nd year and 6th class) to come with me! (except for the eating part ;)). Great piece, Nicki! I’m not so sure my daughters will oblige either…will report back though. Love this route, Nicki. 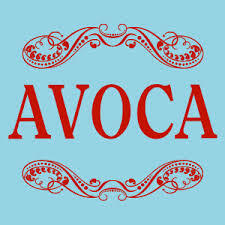 Personally, I’d take Avoca over KC Peaches for food – especially when it comes to baked goods. I simply cannot go into Daintree because I turn into Veruca Salt, wanting EVERYTHING. I’m just as bad in Muji, where the clean, unfussy lines of their goods makes me want to pick up and hold things. It’s ironic that it’s so expensive here – in Japan, it’s their equivalent of, say, Penneys. Everything is so *cheap* there. Sigh. I also love Autumn for the comforting food, the more tolerable temperatures, the return to red wine, and the more flattering clothes. A fantastic time of the year!